The bulk of hotel development across India in the last five years has mostly been in the limited-service sector, via brands like Courtyard by Marriott, DoubleTree by Hilton, Holiday Inn Express, Hyatt Place and Fairfield by Marriott. In the last year, however, a slew of new international luxury hotel developments has been announced that will see India's luxury hotel sector grow and get more competitive. Globally, India will be the third-largest market for Bethesda, Md.-based Marriott International once its merger with Stamford, Conn.-based Starwood Hotels & Resorts Worldwide is finalized later this year. Combined, the two companies will have a portfolio of 100 hotels in India by the end of this year. That's more than triple the 32 properties Marriott currently has in the country. "We have seen double-digit growth in our hospitality business here, and our economic forecast reveals that India's growth will outstrip that of China in the next 10 years," said Craig Smith, president, Marriott Asia Pacific. Early next year, the 238-room Ritz-Carlton, Mumbai, is scheduled to open in India's financial capital, becoming the chain's second in the country. Likewise, Starwood has been aggressive on its expansion here. Last month, it signed an agreement with ITC Hotels, one of India's largest luxury chains, to extend their relationship to include another 11 hotels that will become part of Starwood's Luxury Collection brand. Starwood has other brands pushing into India as well. The W Retreat & Spa Goa is set to open in September, and it will be followed by the W Mumbai in 2017 and the W Delhi in 2018. Also in Starwood's India pipeline are a number of other brands, including St. Regis, Le Méridien and Westin, in key markets. Hilton Worldwide, likewise, has its eyes on Indian expansion. 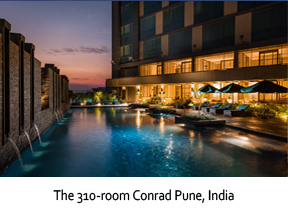 Last month, the chain's luxury brand, Conrad Hotels & Resorts, made its debut in the country with the opening of the 310-room Conrad Pune. The hotel, in the heart of the city's business district, has 20,000 square feet of meeting space. There is speculation that Hilton's luxury Waldorf Astoria brand also might plant some flags there as well. Western hotel companies aren't the only ones bullish on India, however. German luxury hotel chain Kempinski has also announced plans to operate three new hotels in the country by 2020, in Kolkata, Mumbai and Kerala, if its ongoing negotiations are successful. And Hong-Kong-based Mandarin Oriental Hotels, which currently has 13 hotels in Asia, has also singled out India as one of its top development priorities. The next five years should see India's luxury market grow exponentially as hotel brands line up to do business, either as part of a franchise model or as the partner of an Indian hotel group such as ITC. The Great Hotel Brand Race Keeps Heating UpNew hotel concepts from Hyatt, Starwood and Loews enter the marketplace.